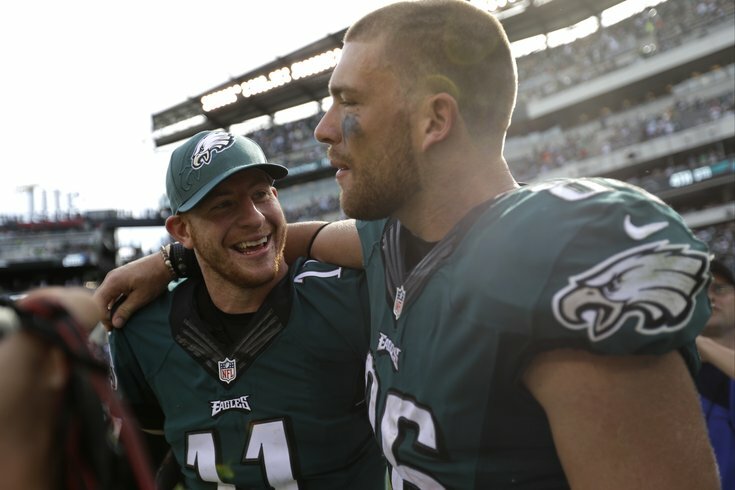 Philadelphia Eagles QB Carson Wentz, left, and Zach Ertz walk off the field after beating the Browns, 29-10, in Week 1. Last July, we unveiled a feature during a relatively quiet period of the sports calendar called #PhillyRank, a subjective ranking of the best professional athletes (Eagles, Union, Flyers, Sixers, Phillies) in Philadelphia at that very moment. The criteria are both fairly simple and also highly subjective: Generally, how good are you at your sport right now? 1. How did you perform last (or this) season? What have you done for me lately? We try our best to avoid any lifetime achievement element in the rankings, such as Kobe Bryant starting in last season’s all-star game. 2. What can we realistically expect from you next season? If a certain player flashes promise as a rookie, it’s not a potential award. Still, age definitely plays a factor here. In the case of the Eagles offensive tackles, the 26-year-old is still getting the nod over the 35-year-old even if he’s clearly worse at not taking banned substances. Track record matters, too. Last time, a Flyers forward entering his prime was ranked highly despite a down year and that proved to be one of our better decisions. The one rule is that to be eligible for the list, you need to have already suited up for a regular-season game in Philly. That means Ben Simmons and J.P. Crawford can’t join in yet, although we’re saving a spot for them. Our hope was to re-rank the players every six months or so, and as we’re doing that, there are a bunch of exciting first-time names. We have the Sixers covered. All of our friends submitted a player-by-player ranking of the team they specialize in, and it was our job to throw them all together into one larger list. And while their input was valued, the final ranking is ours. Don’t assume that the order for each team was the exact same one they sent, even if it’s generally pretty close. • Brayden Schenn: Still racking up points on a loaded power play, needs to be better 5v5. • Jeremy Hellickson: Innings-eater that took one-year qualifying offer, deserves honorable mention. • Tommy Joseph: Earning the first-base job was great story, now up to him to keep it. • Aaron Nola: After a really tough second half, we just want to see that the elbow is OK.
• Vince Velasquez: Also struggled a bit down the stretch, but still has a lot of potential to rise. • Jahlil Okafor: Talented scorer, but too much evidence that everything else is a drag on the team. • Gerald Henderson and Ersan Ilyasova: Both helpful veteran role players, but still veteran role players. • T.J. McConnell: A legit NBA point guard and a three-point shot away from cracking the list. • Richaun Holmes: Needs to play a bit more, which isn’t his fault. • Keegan Rosenberry: Second in MLS rookie of the year voting, should be on sooner rather than later. • Brandon Brooks: The anxiety and missed games was obviously the big story, but appeared to be a decent offseason signing. • Jordan Matthews: One of the final cuts, a solid player asked to do too much as a No. 1 receiver. • Steve Mason, Michal Neuvirth and Vinny Curry are the other three players to have fallen out of the top 25. Sproles is the first of several new additions to the list, thanks in large part to the opportunities he was afforded this season with injuries plaguing the Eagles running backs much of the year. And considering that led to a career high in carries -- and a third straight trip to the Pro Bowl -- while not fumbling once, the 33-year-old was able to claim the last spot on our list despite failing to record a punt return touchdown for the first time since joining the Eagles in 2014. But we're not holding that against him, especially since this could be his last chance to make it. McLeod's play this season likely didn't get the respect it deserved considering the cornerbacks with whom he and Malcolm Jenkins were paired, especially after Ron Brooks went down with an injury. Like Sproles, he's a newcomer to this list, and how long he remains in the Top 25 could depend on who the Eagles select in the draft. There was an argument to be made at the outset of the offseason that the Union should move on from Blake, their best player and the 2016 MLS Goalkeeper of the Year. But despite some European interest over the years, the 26-year-old is back as the number one for both the Union and Jamaican national team. Look for some more highlight-reel saves at Talen Energy Stadium this year. The Phils avoided arbitration with Hernandez, who was a pleasant surprise in 2016. In his first full season as the team’s everyday second baseman, he had a team-best .294 average and .371 OBP, tying for the major league-lead with 11 triples. The 26-year-old infielder can be frustrating at times, but he has earned the opportunity to author a repeat of his breakout season. Rough week for the smallish/skilled 19-year-old winger: At first he was a healthy scratch for a few games (a decision many Flyers observers disagreed with) and now he’ll miss at least a month with a reported knee and ankle sprain. Since making the team out of camp, Konecny has flashed the type of speed that the Flyers have been lacking over the last few years. Ertz seems to take a lot of heat for his play during the season, but all he did in 2016 was lead the Eagles in receptions and receiving yards. And while his #PhillyRank stock may have fallen -- he did have a few questionable "soft" moments and saw his touchdown numbers from 2015 cut in half -- there's no reason to believe it won't trend back after a second season working with quarterback Carson Wentz. Who knows, maybe next year will be the "breakout year" everyone's been not-so-patiently waiting for since the Birds drafted him. Maybe he still doesn’t have the ceiling of someone like Velasquez or Nola, but Eickhoff has been excellent considering he came over as a throw-in in the Cole Hamels trade. Heck, he produced an almost identical WAR to Mr. Hamels last season. Still 26, Eickhoff was a workhorse for the Phils last year, finishing with a 3.65 ERA and 167 strikeouts (to 42 walks) in 197.1 innings. The senior member of our list is holding steady at No. 18. Perhaps that's appropriate given that, at 35, Peters was one of two offensive lineman to start all 16 for the Eagles in 2016, earning yet another trip to the Pro Bowl. Did his age show? At times, manifesting in more penalties than usual. But given what he had to work with at times last season -- not to mention the fact that he may have saved Carson Wentz's life -- Peters belongs here. If he wants to stay, however, he may need to take a pay cut. Jahlil Okafor has been the main subject of recent trade rumors, but this year has also been rocky for the final player who has been in Philly for the entire Process. Despite real offensive improvement, Noel hasn’t been able to make the Sixers bench much better at least in part because he has been poor on the defensive glass. Moving forward, we still value Noel’s strengths and think the Sixers should seriously consider re-signing him. We took heat for ranking RoCo 25th last time, and he’s moving up despite the worst shooting year of his career. Covington has earned Brown’s trust, logging the most minutes per game and always taking on the toughest defensive assignment. And with the Sixers now not much worse than any of the other teams, their second-best player deserves to be rewarded, not booed. Coots is down eight spots from last time around, and while he has missed time due to injury, this is more a case of some new names rising than anything else. Still at 24 years old (although he feels like a grizzled vet), Couturier is still a solid defensive-minded center whose contributions would probably be more recognized if the talent around him improved. Maybe Ghost can read about this in the press box later tonight. Seriously, the idea that Andrew MacDonald is consistently playing ahead of him is maddening. There are areas of his game that can be cleaned up, sure, but the same can be said of every Flyers blueliner. A lot of his play-driving metrics are actually up from last season; he’s just not scoring at the same rate, when he was playing Wayne Gretzky 3D Hockey for stretches. Gostisbehere should be working through any issues on the ice. When we last checked in on the Phillies young third baseman, it was around the all-star break. And, to be honest, he's lucky not to have fallen further after struggling much of the second half. Franco hit just just seven home runs while posting a .238 average after the break, and that could've been worse had he not gotten hot the last month of the season (.306 avg.). Making his first appearance in #PhillyRank and coming in at No. 11 is ... Eleven. If this list was compiled during the Eagles bye week, there's no telling how high Wentz would've been. We're glad it didn't, because we think the entirety of his rookie is more deserving of a place outside the Top 10. There's plenty of room for Wentz to improve -- and plenty of time for him to do so -- after a solid rookie year. How quickly he climbs this list could be tied to how quickly the Eagles go about getting Wentz top-tier receivers, the kind who, unlike his current wideouts, belong on lists such as this.